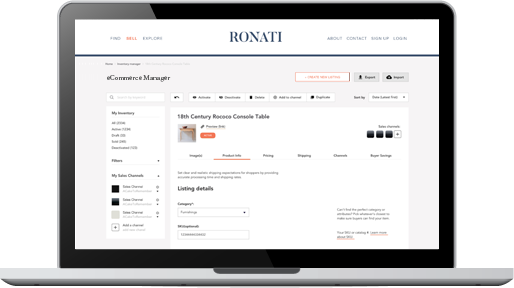 Our eCommerce Manager was designed in collaboration with dealers to ensure it has everything you need, and nothing you don’t. First, we help you upload your inventory. By spreadsheet, internal system or from your website, we’re there with you step-by-step. Easily connect to qualified marketplaces. 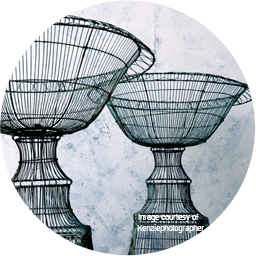 Your usernames and passwords are fully encrypted so we never store or see them in our systems. 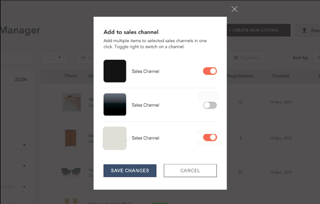 Once you’re connected, you can add, edit and manage your listings across all of your marketplaces. Most major marketplaces have automated protocols, meaning they enable marketplace management tools like ours to communicate easily with their marketplaces. 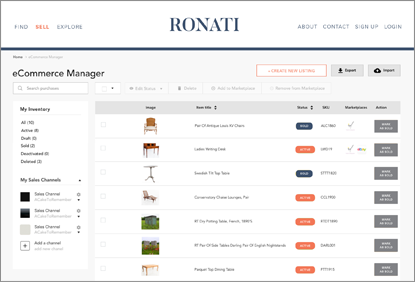 Marketplaces that do not have their own automated protocols but desire a direct connection can request a custom automated connection from Ronati, requiring no development time on their side. Marketplaces that do not accommodate automation are handled through manual data entry. In these cases, we work as an extension of your company as your administrative assistant or data entry team, keeping all of your online listings up-to-date and organized. We don’t touch leads, negotiations or sales.